Janis A. (Stansell) DiNicola, age 70, of Edinboro, PA, passed away on November 16, 2018, peacefully at home surrounded by her family, after a brief but courageous battle with lung cancer. Jan graduated from McDowell High School, then worked at Quinn Barry Plastics, Avantis & K-Mart. She enjoyed bingo/slots, gardening, bowling, movies, reading, traveling by train and bird watching. She had a passion for history, cats and music but most of all, she loved spending time with her grandchildren. Jan is survived by her children; Eric & Keri (Fileger) DiNicola, Anthony & Ella (Therasse) DiNicola, Eileen DiNicola and fiance Troy Linder and Jeana & Gary Wright. The joys of her life, her grandchildren, include Samantha (Jared), McKenna, Joey, Megan, Olivia, Isabella, Avery, Anna, Jocelyn, Madeline, Savana, Julieva, Gavin and soon-to-be step-grandchildren Trenton, Kassi & Kody. She was also survived by her brother Stanley "Buddy" (Diana) Stansell and nieces Stephanie & Shelby and half-sister Elizabeth "JoJo" (Stansell) Korb (Jonathan) and some extended family. 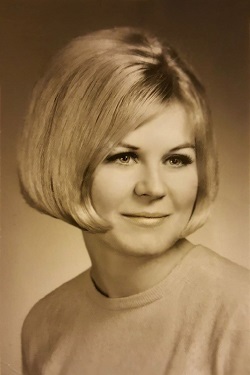 Jan was preceded in death by her parents, Mary Louise Harlacher Stansell Mitchelltree and Robert "Mitch" Mitchelltree and Joel Lee Stansell & Nancy Stansell; her aunt, Janet Harlacher; and the in-laws she cherished, Ofelio & Elizabeth DiNicola. The family sincerely appreciates all the care given by UPMC Hamot, especially Holly, Laura, Mel, Angie & Kayla (7 South) & the wonderful Interventional Radiology Team. Our eternal gratitude goes out to the exceptional staff of AseraCare Hospice and to our friends and coworkers for their endless support. Following Jan's wishes, there will be no viewing or visitation. The family requests memorial donations be made to the Regional Cancer Center (Erie, PA), St. Joseph's Indian School (Chamberlain, SD), St. Labre Indian School (Ashland, MT) or the Paralyzed Veterans of America (Wilton, NH).